I keep popping in and out of this blog despite promises to stick around... Sorry about that. And more than anything, I'm so sorry I've been absent on your blogs and lack of comments. I've missed being a productive member of blogciety, though, and I'll be catching up in the next couple days. This time, I have good reason for falling off the face of the earth! 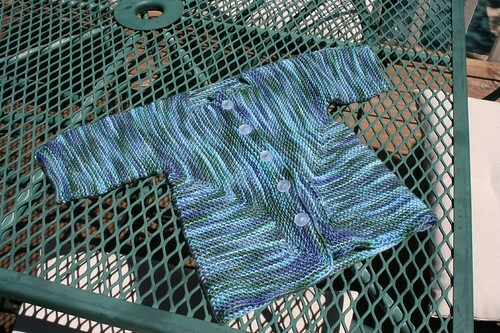 But first, I have some FOs and WIPs to report, but photos only for this little sweater... 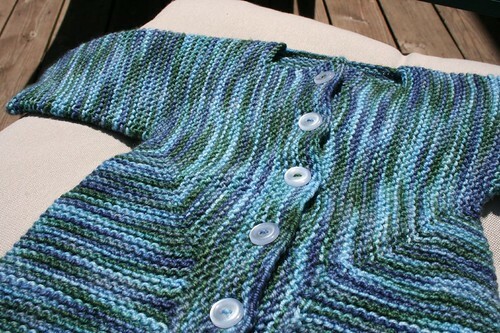 I made this sweater for my cousin's baby, Jos. I've been saving this yarn for a baby boy sweater, but it seems that most of my pregnant friends and family wait until the baby's born to find out the gender. So, a blue sweater doesn't always work. Until this time! Now, I'm just crossing my fingers that it will fit him in the Fall. The sweater was held in customs at the Paris airport for the last several days, apparently it was questionable because it was wrapped. Of course, the first handknit item I trust in the mail! Thankfully, I heard from my cousin today, she loves the sweater, and said her first through upon opening the package was, "I wonder if they make these in adult sizes." I'll take that as a compliment! Comments: There's not much to say about this sweater that hasn't already been said. EZ is obviously a genius. I just sat back and trusted her directions and voila - a funny shaped panel of knitting magically transfrormed into an adorable baby sweater. If only it could change diapers, too. Time to Knit: A trimester. Did any of you catch that part? So, this is the first of many baby items, but finally I will be making them for my baby! As much as I wanted to be productive with blogging and knitting, it just hasn't been in the cards the past few months. Knitting made me nauseous, sitting up made me nauseous, thinking about sitting up made me nauseous. You get the picture. And that's the just the nausea, the exhaustion is an entirely different story. As much as it would be nice to chronicle this time, I even paused my 365 self portrait project because all my photos were of me sleeping. In any case, I'm well into my second trimester now and hope this will be a permanent re-entry to blogland. We find out next week if we're having a boy or a girl, so I can dive into my baby knitting and sewing. My baby (also called "the fetus" and "the little macaroni") is due in November and will require a full stock of handknits, so I have to get cracking. Also, I hope to make a quilt and other decorations for the nursery. 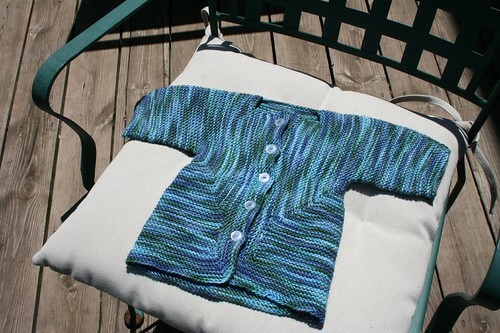 At least baby items are small and conducive to summer knitting.